René Descartes was one of the most influential philosophers of the post-medieval era, whom Hegel had called "the father of modern philosophy." Although he was educated according to the Scholastic tradition, he rejected it and tried to liberate philosophy from its influences and advance human knowledge through science. He assisted the scientific progression of mathematics based on the fusion of geometry and algebra, he studied physics and other natural sciences, explored new models of analytical reasoning, which would later serve as a framework for later scientific protocols. As a philosopher, he contemplated on a variety of concepts, like the nature of emotions, the nature of awareness and the existence of God. He distinguished between the mind, which he considered as proof of existence in his famous statement "I think therefore I am" and the mechanistic principles of the body. Because most of the issues he dealt with were highly controversial and his theories could be considered as radical and opposing the religious beliefs of his time, he carefully tried to avoid expressing his full views both in his writings and in public. René Descartes was born in a well-off family, on March 31st, 1596, in La Haye, a small town in the province of Touraine in France. His father was a lawyer and judge, but his mother, Jeanne Brochard, died shortly after his birth. He was brought up by his maternal grandmother and when he was 10, he was sent to La Fleche, the Jesuit Royal College, which Descartes later praised as "one of the most celebrated schools of Europe" to which he related his beliefs and his doubts, his gratitude for his acquired abilities and his dissatisfaction with the contradictory theories in his textbooks. When he left La Fleche, instead of considering himself to be a learned man, Descartes thought that his knowledge was incomplete and inadequate and became resolute in discovering the truth, as far as that was possible. Two more years of studying followed in Paris and when he took his degree in law at the University of Poitiers in 1616, he decided not to follow a career in law, as it was his father's wish, but to spend time travelling to gain personal experience of the world, and as he stated, "to make studies within himself." He wanted to learn about other cultures, mix himself with people from all walks of life, and derive knowledge and wisdom from "the book of the world." In 1618 he went to Holland and joined the army of Maurice of Nassau, but it is doubtful if Descartes ever took part in any real fights. He mentioned that the camp life involved "too much idleness and dissipation", but while he was in the army he met Isaac Beeckman, a physicist, philosopher and professor, and their close friendship gave new impetus to his interest in physics and mathematics. Their friendship was a long-lasting one, and Beeckman was amazed by Descartes's ability to solve even the most elaborate mathematical puzzles in a short time. 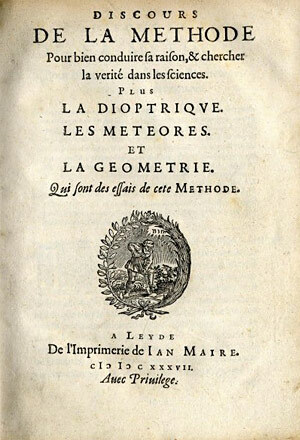 In 1637 Descartes published his treatise The Discourse on Method, the most widely read of his works, in which he applied algebraic formulation to geometry, which was to become the basis of modern analytic geometry. During and after his military service, Descartes travelled to Denmark, Poland and Germany. He returned to France where he stayed in Brittany and Paris, and then from 1623 to 1625 he travelled around Italy, returned to Paris again for a short time, and finally, in 1628, he settled in Holland, apart from a few short absences, until 1649. It was during those 20 years when he wrote all his major works that made him one of the most famous European philosophers and mathematicians. In 1649, he accepted one of the many invitations of Queen Christina of Sweden, who was anxious to meet "the celebrated M. Descartes." On his arrival in Stockholm, in October 1649, and commenting on the harsh climate of the place he wrote: "born in the gardens of Touraine, I have come to the land of bears between rock and ice." His fear of the cold Swedish climate proved right, because on February 1st, 1650, he caught a cold that turned into pneumonia and ten days later he died in the land where "men's thoughts freeze during the winter months." Apart from the fact that Descartes was an excellent and creative mathematician, he was also a great natural philosopher and an original thinker in metaphysics. Analytic geometry, the law of refraction, the theory of the formation of our solar system and the cosmos, were all taken into account in his many works. He also dealt with metaphysics and provided us with his thoughts about the existence of God by using his method of doubt. Moreover, Descartes explored issues related to consciousness and perception, while demonstrating the system of reasoning that he would use as a foundation for his philosophical ideas and logical conclusions. Everything known should be questioned and considered as assumption, except for things that reason would clearly hold as being true. A famous example of this would be his saying "Cogito, ergo sum" - "I think therefore I am"- which implies that the mere act of thinking whether one exists, is proof of his existence. Analyze a complex idea by breaking it to its constituent parts for further and distinct analysis, so that reason will be able to apprehend it intuitively. Synthesize the ideas from the simplest to the most complex, in order to reconstruct a logical and coherent working whole. Review the process all the way through its steps, using both induction and deduction methods. Descartes was a rationalist and the founder of Western skepticism, who believed that the best way to gain secure knowledge was through the clarity of intellect, and doubted the Aristotelian concept of the necessity of the senses in the formation of knowledge. He also maintained that by withdrawing the mind from the senses, man would be able to understand the fundamental truths of metaphysics. The way Descartes followed this line of reasoning, is more thorough than one would guess at first sight. By setting off to doubt everything, including the existence of the world and nature, even the senses of his own body, he speculated that by just witnessing things around him did not mean they were real if proof could not be provided. A dream, he said, is felt as real the moment we experience it, but when we wake up we understand its illusionary essence. The only thing he could not doubt, was the fact of his own thought, which was solid proof that he, himself, existed. As for the other sensory stimuli, he made a scenario that could put them in doubt. Descartes wondered how he could avoid being deceived, if there was an evil daemon, with clear intent to deceive him by projecting a virtual reality directly on his senses. This would mean that what he saw as his body, or the external world, would not be real. However, in relation to the existence of God, Descartes maintained that because the mind has a certain propensity for intuitively grasping clear and distinct truths, and because the idea of God is infinite, its cause must be an infinite being, therefore God exists. This reasoning process was a very influential example, which he showed that things should be questioned at length, so that thinkers could have knowledge that was based on absolute fact, rather than assumptions, and how knowledge can be reconstructed from a blank slate. Descartes's enthusiastic disciples spread his doctrines all over Europe provoking at times bitter opposition. Despite all controversy, Cartesian thought revolutionized Western philosophy, as his views promoted the unity of all sciences, the order of reasons and the interaction of body and soul. In his Meditations, he opened a new way of acquiring wisdom through the truths of metaphysics which eventually leads to the knowledge of God, or the "Supreme Good."